The Under 18 Channel League fixtures for 2019 have now been finalised. 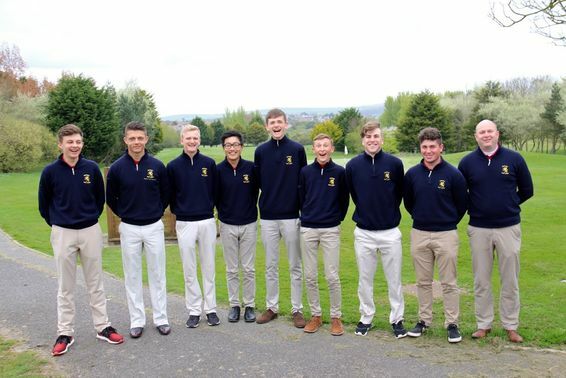 A fabulous performance from the County boys resulted in them being crowned regional County champions at Came Down GC . They now represent the South West at England Golf’s county ﬁnals to be played at Northampton GC from the 29th Aug - 1st September. The course at Came Down represented a stiff challenge on a beautiful hot summers day. After a days practice each of the six counties taking part, Somerset,Cornwall, Devon, Dorset , Wiltshire and Gloucester were required to select 6 players to represent them in the championship. Somerset’s 6 were Taylor Stote (Enmore Park) Tom Plumb (Sherbourne) Dylan Xanh (Mendip Spring) Jake Bovington (Enmore) Louis Archer and Huxley Howell (Saltford) The team were up against some of the best young players in the country including Jack Cope (Gloucester) and James cooper (Wiltshire) . The squad was strengthened by the inclusion of England boys international Tom Plumb and former England representative Taylor Stote. The championship is played over 36 holes with the best 5 scores from each round to count. In the ﬁrst round there were solid performances from Tom and Taylor shooting level par 70’s. Dylan did well with a 1 over par 71. Decent scores from the rest of the team gave the team a total score of +10 , just 2 shots clear of reigning champions Wiltshire and 3 clear of Gloucester. So there was everything to play for in round 2. Tom got away to a great start and was - 4 after 15 holes following a great birdie ,he eventually recorded the best 2nd round score of -3. Taylor supported him with a great 1 under par 69. So it came down to the remainder of the team to score well. The target set by team coach Russell Covey was to better the morning score by 1. Louis Archer did better and recorded a 2 over par 72. This put us clear of the other counties but with 3 scores to come in it was very close. Dylan came in with 77 and Jake 78. So it was down to Huxley to record a score. After an unlucky triple bogey on the 8th he slipped to +4 with ten holes to play. He dug in and after two birdies and two bogeys was still +4 standing on the 18th tee. He hit a great drive and put his edge to twenty feet. A good lagged put left with a tap in for par. His score when added to the other 4 to count gave us a total of +9 for round 2 and a total for both rounds of +19. The score was good enough to see us home by 8 shots. The team deserve great credit for the way they applied themselves on a testing day . The hours of practice and dedication were rewarded and they enjoyed the moment. Huge thanks go to the team who support the boys including County coach Russell Covey, James Lambdon sports psychologist Dave Copeland Strength and conditioning, Ethan Desmond Putting coach and the players home coaches. On the day the team was well supported by SGU exec members, Tommy Tulk, Paul Middleton, John Patterson, Norman Banﬁeld and Richard Dix, their support was much appreciated. We now look forward to the County ﬁnals at the end of August where we represent the South Western Counties. The competition was hosted this year at Weymouth Golf Club and organised by the Dorset Golf Union. The two days gave mixed fortunes for the Somerset team with both high and low points. Day One started with the Strokeplay event which was dominated by the team from Dorset. Their combined total of 440 gave them a winning margin of 15 strokes over second place Devon. Somerset finished in 3 rd place on 464 with Cornwall a further 6 points adrift bringing up the rear. In the individual event, Dylan Xanh from Mendip Spring finished as runner up with a round of 72, 2 shots behind Jacob Hunter from Dorset. There were also rounds in the 70s from Charlie Camper, Huxley Howell and Jack Partridge. In the first of the matchplay events, we suffered an emphatic defeat at the hands of Devon who won all the matches. Dorset continued their good form recording a 4-3 win over Cornwall. On the second day, we enjoyed a narrow win over Dorset 4-3, our successes coming from Dylan Xanh, Huxley Howell, Jack Partridge and Louis Archer. 5 of the games went to extra holes after some remarkable golf. But we were beaten in extra holes in the games involving Josh and our foursomes pair of Charlie and Matt. Devon took the match play title on count back with two wins. Dylan was the winner of the County trophy for the best overall performance at the championship. The Somerset team will have learnt a great deal from the experience and will be better equipped for the South West Counties EG qualifier at Came Down in July. My thanks to coach Russell for all his hard work and the support from Tommy Tulk, Paul Middleton, Norman Banfield and Martin Higgs.